For Sarai, the only thing worse than a barren land was a barren womb. So, turning to her culture’s custom, she told her husband, Abram, to give her children through her Egyptian maid, Hagar. But when Hagar conceived, Sarai became resentful and mistreated Hagar, who then fled. The Bible says that the Lord found Hagar “by a spring of water in the wilderness, by the spring on the way to Shur” (Gen. 16:7). 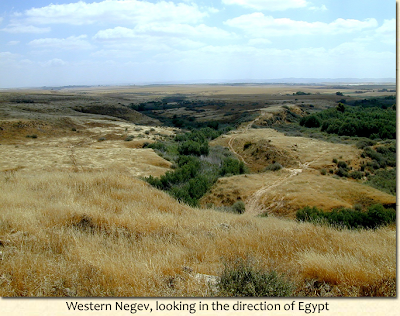 The location reveals that Hagar intended to head back home—to Egypt. But God told her to return to Sarai and to name the child Ishmael (meaning, “God hears”), “for the LORD has heard of your misery” (v. 11, NIV). Hagar did so, and she called the Lord El Roi, “the God who sees me.” The well by which she sat received the name Beer Lahai Roi, meaning, “the well of the Living One who sees me” (see vv. 13-14). The meaning of the names “God hears” and “God sees” would remain constant reminders to Abram and his family. Earlier, Abram had run to Egypt to escape a famine in the land (see Gen. 12). Sarai had turned to an Egyptian to escape barrenness. Hagar had run to Egypt to escape misery. But each effort, apart from God, found them at the same place of having to trust Him all over again. How often have we traveled the road to Shur toward some Egyptian decoy, running from a chance to trust God? In situations today when we feel like running, may God find us instead on our knees—before a God who hears and a God who sees. The Lord wants us to learn to turn to Him rather than run to Egypt during what seems inescapable despair. As we wait on the Lord, we have His promise that He waits with us, for God hears our prayers and God sees our needs.